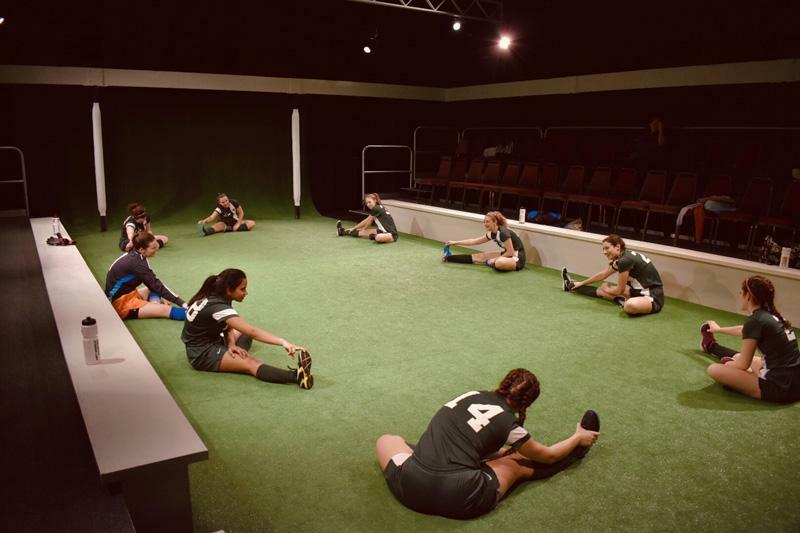 Two weekends ago, ten fiercely talented women battled it out on the Gannett Theater stage, which was transformed into an indoor soccer dome complete with netting, Astroturf, and sideline benches. Rebecca Berger ’19, in partial completion of a thesis in directing, brought the 2017 Pulitzer Prize nominated play, The Wolves, to life in a beautiful exploration of modern teenage womanhood. The Wolves centers around a suburban women’s indoor soccer team. The girls all go to different schools and come together to do the one thing they are most passionate about: soccer. Each character is only referred to by the number on their jersey, not name, because on the field, they aren’t someone’s friend or daughter or girlfriend; they are a soccer warrior. Over the course of four pre-game warm-ups, the characters discuss current events, other players and teams, school, and friendships. It is a biting, witty drama that showcases women who are in their element, who are not defined by anything other than their skill, and the pain that comes with growing up. Berger’s sharp direction highlights the soldier in each of the women while still allowing them to showcase moments of vulnerability. Before the lights are fully up, we watch all of the actors enter in an almost march before taking their place in the warm-up circle. Each warm-up maneuver is done in sync, as a unit. But they are individuals, too. #1, played by Stine Carroll ’20, has intense anxiety and does not speak for the most of the show. In an interlude before the final scene, we watch her have a full-blown panic attack isolated on stage; she’s left hyperventilating on the floor with only the stunning lighting design by managing director Michael Reidy for company. #2, played by Katie Abramowitz ’21, is implied to struggle with some sort of eating disorder. After the second scene, she binge eats orange slices in a heartbreaking portrayal of the disordered eating binge-restrict cycle. #30, played by Nicki Lane ’21, has grown up around the world and is struggling to fit in with the team, who mistakenly thinks she lives in a ‘yogurt’ rather than a ‘yurt.’ After being left out again, she juggles a soccer ball for a minute while chanting: “I live in a yogurt my feelings don’t get hurt!” to the shock and confusion of the others. Each girl gets a chance to showcase themselves, to fight and comfort each other, and to realize that even in this team, even in this synchronized unit of soccer soldiers, not all of them can be perfect. The ending is the most gut-wrenching of all. Over the course of the final pre-game warm-up, we slowly learn that #14, played by Shae Gwydir ’20, was recently killed while jogging at 6AM. The girls discuss whether or not she should have been wearing headphones and the driver’s visibility, who should’ve seen her coming. 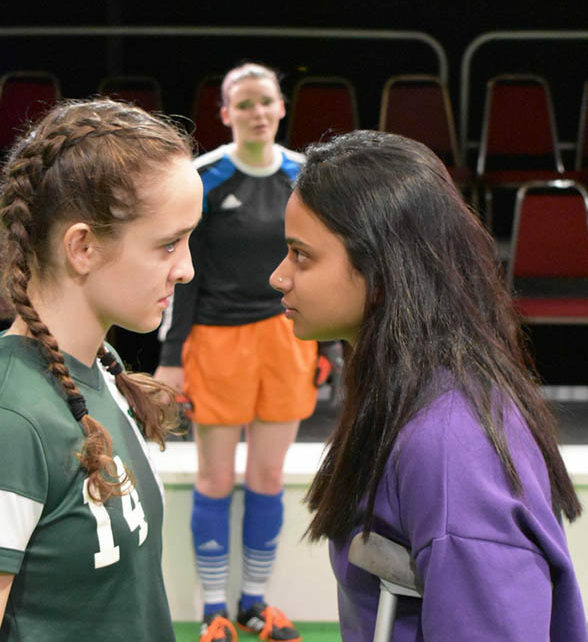 Her mother (Soccer Mom, in the script), played by lecturer in theater Sally Wood, has a monologue addressing the girls and her relationship with her daughter. It is the first scene in which any of them are referred to by a name. Wood’s monologue is a beautiful but gut-wrenching moment as the eight remaining girls realize that there is a world outside this dome, that the Astroturf is not always a safe haven, that they aren’t just soldiers but daughters and girlfriends and, perhaps most importantly, teammates, on the field and in life. I am not a crier, but I was moved as the girls and Soccer Mom slowly began to break down as they came to this realization. To go from that to the show’s final moments which feature the girls screaming, “WE ARE THE WOLVES!” is empowering transformation in a morbid way because of the route playwright Delappe took to get there. But isn’t that life? Power unfolding from tragedy? Most impressive, however, was the soccer. The actresses handled the drills with practiced ease, as if they had all, in fact, been playing for ages. There are brief interludes that feature games, and while there was no actual soccer going on, I was ridiculously impressed. Reidy’s lighting design worked with Billy Grummer’s ’21 sound design to simulate a game: a single spot traveled across the field like a soccer ball, and pre-recorded lines said by the various players were played over it alongside whistles and other game-related sounds. I am still in awe of the beauty that was this production. An absolutely brilliant team, both on the field and off, shared an amazing work with us, and I am ever so grateful for it.